This has been the decade when people have rediscovered the book. And that's been prompted by some important new references, starting with Fotografia Republica, published by Museo Nacional Centro de Arte Reina Sofia to coincide with its exhibition during Photo Espana in 2000 and edited by Horacio Fernandez. It was really the first to publish actual spreads from books and magazines, so we must always credit him for getting the ball rolling. Next was Andrew Roth with The Book of 101 Books (PPP Editions, 2001), whose list was predominantly American, with a few Japanese thrown in. And then of course there was my and Gerry Badger's contribution (The Photobook - A History, published in two volumes by Phaidon in 2005 and 2006), and since then there have been many others. So suddenly the status of the book has improved dramatically and people now take it a lot more seriously as a contributing factor to our understanding of photographic culture. I have always maintained its significance, being a photographer and knowing that I and other photographers always cite books as their inspiration. History is so subjective; it's constantly in flux. It's usually written by theorists and academics, who don't have the same regard for the photographic book that photographers do. So we think of our (Parr and Badger's) contribution as being a revision of history, taking on board many books and photographers that have been somewhat marginalised and overlooked, and bringing them to the attention of a wider audience. First off, a good book consists of great pictures. Secondly, you've got to have the production and the narrative that really makes those pictures come through to the viewer most effectively. Every aspect of the book has to be working in its favour. One of the criteria I've used here, in my selection of books from the past decade, is whether the book explores different ways of printing, different narratives and different looks and feels. The way that Dash Snow organised his books is integral to the understanding of his work. Others are more traditional. Rinko Kawauchi's book, Utatane, is not dynamic in terms of production values, but the photographs are nonetheless beautifully laid out and simple to read. Photographers and designers are exploring creative possibilities a lot more, but all we're doing really is catching up with the great achievements of the Japanese. They were doing all this in their post-war publishing period in a way that was so far ahead of the west it was quite remarkable. The thing that still completely stuns me is that we chose to ignore this. So until I went there in 1992, I had no idea how spectacular the books were. I'd seen the work of many of the photographers, in books such as Mark Holborn's Black Sun: The Eyes of Four, Roots and Innovation in Japanese Photography (published by Aperture in 1986) and curated into shows such as John Szarkowski's New Japanese Photography in 1974, and I liked the pictures. But it's only when you see the books that you realise how amazing they were as vehicles for ideas within photography. Now we've caught up, and the design aspects of books are so much bolder and more adventurous than in the 1960s and 70s. That was the great heyday of American photography but the books they were producing were not as exciting as the actual work, and you'd have two white pages with a picture on the right. At the same time, the Japanese were exploring full bleed, special cuts and all kinds of other things. Occasionally in Europe and America you'd have someone like William Klein in 1956, who would tear up these rules and do something radical, but in general we were much more conservative. Now the playing field is much more level and we are learning what the Japanese learnt 30 or 40 years ago. This is evident in some of the books in this selection. We need and require mainstream publishers, but their books tend to be a lot more conservative. So the real workshop, and the place where people can experiment with ideas, is small publishers, or indeed self-publishing. The quality and variety of print-on-demand books is improving. When people like Blurb first appeared they too were very conservative, but they are constantly improving. In another 10 years time, you'll find many more photographers self-publishing their own Blurb books. One thing that's problematic with all this is that all photographers believe they deserve a book, and that it will have a dramatic affect on their careers. Sadly, very few of these books capture the imagination and become a cult item. For most books, if you sell 500 you're very lucky. Few have the momentum of some of the books here, which are celebrated and collected and known as being important signposts in photographic publishing. The reason Japan was so successful in the post-war Provoke period was that designers were literally given pictures by photographers and asked to come up with the ideas. Total collaboration with amazing designers such as Tadanori Yokoo allowed photographers to create these incredibly exciting books. But the potential is still underexploited - as is the capacity to be bold, to be exciting, and to really think and problem solve. It's getting the balance right. You've got to have the right project and the right vehicle to bring it to its full potential, and that's not such an easy thing to determine. Photography is often a problem-solving exercise and so is making a book, thinking of ways of making the work you've got come out and sing on the page more effectively. So often conservative design holds things back. If the status of the photobook goes up then inevitably there's going to be more demand, people will collect them and their prices will go up. Ultimately that has to be a good thing but the exciting thing is that all of the books I've listed could be bought for a very reasonable sum when they came out. They have become more valuable because they've gone out of print, and people wanted them. Anyone can go out and buy a good book at the ordinary retail price but if you get it right and pick out one with great design and pictures, not only will you enjoy it, your investment will potentially go up. The sport of spotting the good books is very exciting to me. You can curate a collection of books in the same way you might curate a selection of prints, and it's much cheaper. There are these very few specialist bookshops, but in London I recommend Mike Wells (in Camden), The Photographers' Gallery, Clare de Rouen, Photobooks International and Donlon Books. They stock books you wouldn't normally see, from places such as Japan, and they're also very good people to talk to. They've got their have got their ear to the ground and can share the knowledge they've accumulated. You should also look at 5B4, the book blog. Marcus Schaden, in Cologne, is hugely influential. In fact he's probably the key person in the whole world selling contemporary photography books. If there's one person to listen to, it's him - even curators go to him for recommendations. No one knows the market better than him and if he gets excited about something he has the amazing ability to sell a lot of copies. I always advise people look at his homepage to see what he's recommending because there's a very good certainty that what he's recommending will go out of print and become collectible. As to my own library, at some point I'd like to donate my photography books to the State but how or when that will be organised I do not know. It take so long to get things organised. I'm currently collaborating on a book about Latin American photobooks, but it's been put back until 2011 because the scale of the task is so vast. There are five or six major territories to cover in the region - Mexico, Peru, Chile, Argentina and Venezuela - and then there are the smaller ones. The research required is vast, and writer and curator Horacio Fernandez has been working on it full time because there's so little information or knowledge. It takes a long time to digest. Certain countries in Latin America, such as Brazil and Venezuela, are extremely rich, but in terms of contemporary practice I'd say Argentina is the hottest country right now. I'll be featuring Argentinean photographers in Brighton next year (when Parr will curate the Photo Biennale). Out of all my travels, I'd say it's the new hot spot. What's absolutely fascinating is that there's no school of photography there whatsoever. In the UK we have 3000 to 4000 students coming out of college each year, and they have none. And yet the people who are really good are so committed and determined that they do it anyway. The fact that there are no schools makes it better. When they really work, they really mean it. All the books listed here have fantastic images and superb production values that make them, and become classics in their own time. Often quite radical, and therefore sometimes only appreciated after some time, they are all bound to go down as big contributors to our ongoing photographic book culture. McGinley almost single-handedly revitalised American photography in a way Nan Goldin had done 15 years earlier, with his images of his friends having a wild and wonderful time. This edition of 100 was a shining beacon of how a small self-published book can announce the arrival of a major new talent. This beautifully-produced book shows the fascinating relationship between the photographer and his mother, an ex ballet dancer. A searing investigation of a strange and sometimes sexually charged connection, it combines notebooks and photographs and remains gloriously ambiguous. Gossage is one of the true original voices in photography. 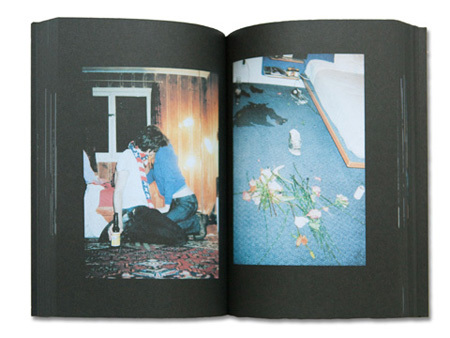 He spent many months exploring Berlin in the 1980s, and this tome is an index of urban possibilities with photography. Never too dramatic and always fresh and original, it is a remarkable journey around the wall, in the run up to its welcome demise. From time to time a new photographer arrives on the scene who is difficult to classify. Kawauchi is one such photographer. Her images are so fresh, so simple and original, it almost defies belief. Utatane translates as siesta, which does give you a clue about her images' dreamlike quality. This book has been reprinted many times and Kawauchi is now known and appreciated internationally. In his short creative life (he died earlier this year at the age of 27), Dash Snow re-invented how the book and the zine looked and felt. Usually surrounded by matt black ink, he juxtaposed images of his friends with newspapers and Polaroids in both colour and black-and-white. Slime the Boogie was published in a limited edition of 300, and is the best of his books. This book was the second Gill self-published, and started a remarkable run of publications by one of Britain's newest and most ingenious photographic talents. It features images of a Hackney market taken on a 50p plastic lens camera sourced at the very same place. Graham is a restless photographer, and is constantly thinking up new ways to represent the world. This book, which consists of 12 separate narratives in 12 separate volumes, was universally applauded on publication.